Korean War Era. He was stationed stateside. 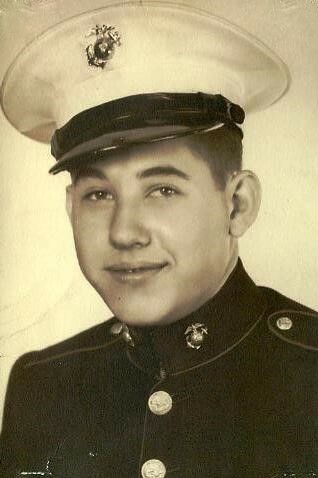 My father was a proud Marine. He reminded us regularly "Once a Marine, always a Marine". His service took him from his home in rural Missouri to his first visit to California, where he fell in love with the state. He returned to Missouri after his honorable discharge, married my mom, and they packed up and moved west. They lived in Los Angeles and saved to buy a home. In 1960, he used his G.I. bill to purchase the home in Lakewood. He loved this city and his home. Our home was purchased before it was built. I remember as a young child my mom packing a picnic lunch and us driving out here and having a meal sitting on the dirt on what was our lot, then watching over the months as the house grew from the ground up. How pleased we were when they laid the porches. We would sit on the steps of our home to be and talk about how our life would be so much better in Lakewood. He passed on in 2009, leaving the home to me, his daughter. I live here with my family. The flag from his military funeral (along with a letter of appreciation from President Obama) hangs proudly on my wall. When my mother was very ill in a nursing home in 2010, she relived those days as a Marine wife. She got a stuffed bulldog and asked me to make it a little Marine uniform. She then asked if we could bury her with that stuffed dog, which we did. After my parents' deaths, my siblings and I cleaned out the garage, and pulled out what we always called "Dad's Marine Corps trunk", a mysterious but beautiful travel trunk decorated with stickers from exotic places, like Barstow. Inside we found his dress uniform, pins, ribbons, magazines; all his memories of his days of pride, packed away with loving care. My daughter was born on November 10 and he reminded her each year that she shared her birthday with the Marines. She celebrates with the Marines each year even now. Semper fi, Dad. With love from your remaining children, Karla, Sharon and Mark. We know you, mom and Tim are celebrating in heaven. I hope you see us as YOUR few, your proud. Bought his first home in Lakewood in the early 60's and lived here many years.